This Blackberry-Mango-Peach Nice Cream Bowl is a delicious and healthy breakfast, snack, or dessert. It is the easiest ice cream I have ever heard of, and vegans and non-vegans alike can enjoy this cool treat. I think that ‘nana nice cream might be a vegan’s biggest weapon. For those of you who may not know, it is a 1 ingredient, 2 minute-no churn vegan ice cream. Oh, and it makes the creamiest and most delicious ice cream. The secret is frozen bananas. The hardest part of this is waiting for the bananas to freeze. Luckily, I keep a bag of frozen bananas in my freezer at all times in case I have a nice-cream emergency. You want to freeze your bananas when they are spotty, but not too brown. I like to peel and break my bananas into chunks for easy blending. You can make tons of flavors of nice-cream, from peanut butter chocolate to date caramel. The other best part about this blackberry-mango-peach nice cream? It is made from bananas making it full of potassium, fiber, vitamin B6, manganese, vitamin C, biotin, copper, low in calories, and no added sugar, AKA its healthy! Thanks to that, it makes a perfect, breakfast, snack, lunch, dinner, whatever. You do you. It’s like the universal ice cream meal. 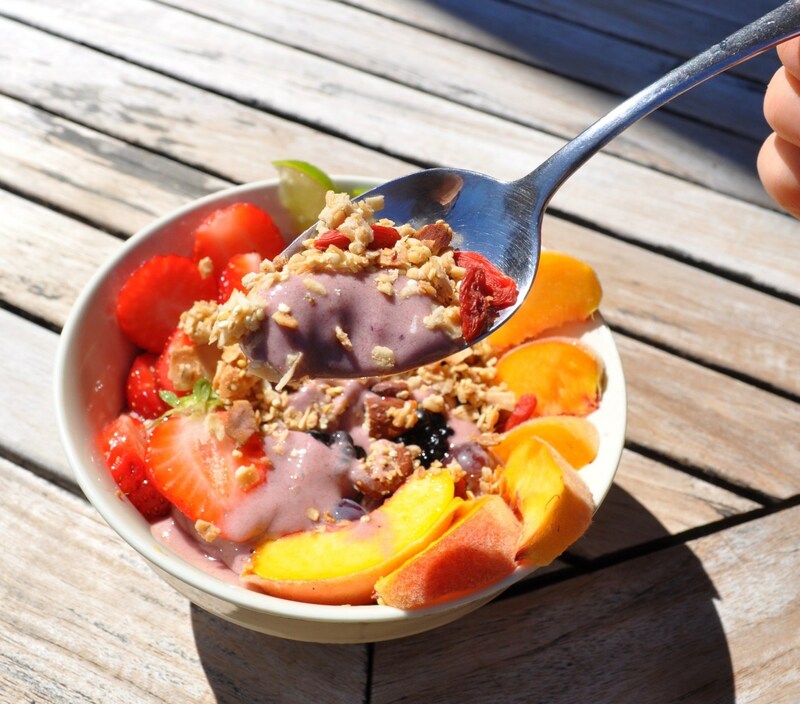 I topped my blackberry-mango-peach nice cream with fresh strawberries, peaches, lime, blackberries, grapes, and my homemade coconut quinoa granola. Add banana and mango to a blender and pulse until it is in little chunks and looks almost like dippin' dots. Add peach and blackberries and blend again. It should become a thick, soft serve-like texture. IF your blender can't handle it, add water a little at a time until blended. To serve, top with nuts, fresh fruit, granola, etc.